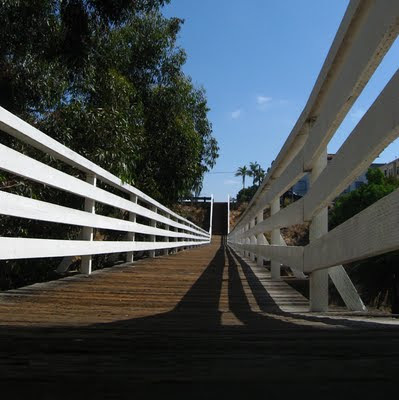 The Quince Street Bridge in San Diego, was built in the early part of the last century, to enable pedestriants to cross a canyon. Beautiful blue sky! Love the line and how it takes you right through the picture. That looks like a great bridge! I'm just wondering how far down is the canyon? LOL I probably wouldn't want to look down. Like the picture though, especially the shadows.. It looks like such a long bridge! It looks great shot for that bridge...happy SOOC Sunday. Mine is ready too. I'm a little paranoid about crossing bridges that are really high off the ground. I have a fear of heights, in case you can't tell. Great photo! Have a great day! Very nice. I like the shadow.